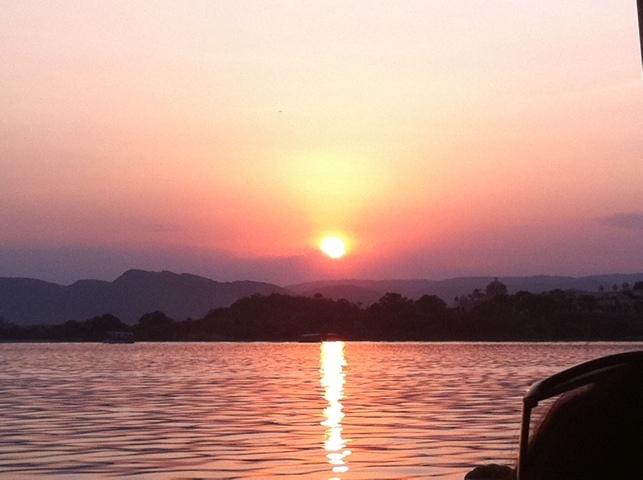 When we arrived in India at the end of September, we weren’t sure what to expect, or whether we’d enjoy it. After five amazing weeks, we can hardly believe we doubted the place – utterly inspiringly incredible, although certainly not blemish free – but who’d want something that pristine and artificial anyway? Sitting here in a hostel in Saigon, there’s much to think back to and miss. People sleeping absolutely everywhere in the heat of the day – conventionally in the shade, but more entertainingly on tables in busy offices, on pavements, and even on the central reservation of thundering dual carriageways. Down these roads hurtle the colourful Tata lorries at breakneck speed, alongside tankers with ‘edible oil’ (for cooking? ), rickety buses lurching round corners, and of course the yellow and black of rickshaws, all of which use their horns continually to announce their presence. And that’s without touching on the amazing train system, the rusting ferries, and of course houseboats – occasionally with furry stowaways. I think above all India invades every one of your senses and tests your ability to contrast: the sight of brightly coloured turbans in the north against the white Mundu skirts that men wear in the south; the smells of rich masala sauces wafting from the kitchen and the stench of rotting rubbish; the eternal screech of the horns in the road, and the absolute silence of the desert. These contrasts seem to pervade India itself – most obviously through the difference in landscape and climate between the harsh desert of Rajasthan and the mangrove swamps of Kerala, and in the face whitening creams sold endlessly on TV while westerners are on the beach trying to go from white to brown. I think the juxtaposition goes deeper than just the surface though, to an emotional level – for India is a country whose soul is so religious and moralistic, but yet lets the horrors of caste, corruption and poverty happen – indeed religion endorsing it in the case of caste, even if there is now movement to see both caste and corruption confined to the days of the past – in the end. Leaving India was also the end of our long journey overland from Beijing, with a flight to Vietnam for the next leg of our trip. We’ve apparently travelled 6420 miles by train (almost exactly as far as we are away from home right now), plus another 940 by road. With almost 7500 miles travelled the old fashioned way over 11 weeks, it’s sad to be taking to the air instead! So, we bid a final farewell to a land of stunning forts, palaces and natural landscape, of friendly people, the tastiest food (which some of you back home will get to experience) and harsh weather (which hopefully you won’t!). Each of these things we’ve at times had too much of – but that doesn’t mean we won’t be back for more sometime soon! Anyone care to join us for a second lap? Being a huge fan of Indian food back home I was slightly afraid that the real thing may not live up to expectations…Needless to say my fears were totally unfounded! Our sortie into the highly spiced world of Indian cooking may have had a shaky start as we waited for our stomachs to settle after the inevitable bout of “Delhi belly”. However, once recovered, we delightedly delved in! Indian food varies from region to region but has proved to be tasty in almost every form. Generally breads (such as naans, parathas and chappattis) are more a phenomenon of the North, as are tandoori (clay oven cooked) and meat dishes. This is not to say that meat and bread do not appear in the South, just that you are more likely to find vegetable and seafood dishes. During our Indian cookery class in Udaipur we learnt how to make pretty much any kind of flat bread that you could ever desire. The basic ingredients for any Indian bread are flour, water and a pinch of salt; mix, knead, roll out and cook dry on a heavy iron plate and you have a chapatti. Parathas are essentially the same with a little oil folded in and used to coat the bread whilst cooking. Naans are slightly more complex with curd (natural yoghurt), baking soda and sugar added to the flour, and rested for 30 minutes before cooking (traditionally cooked in the tandoor, although a hot iron pan will suffice). Parathas and naans can also be stuffed with any filling of your choice, be it fruit, vegetable or meat to provide an endless variety of breads. And the difference between all of these?Chapattis are your common everyday accompaniment to a meal whereas naans are usually reserved for special occasions (well going out for an Indian in England is always a special occasion right? 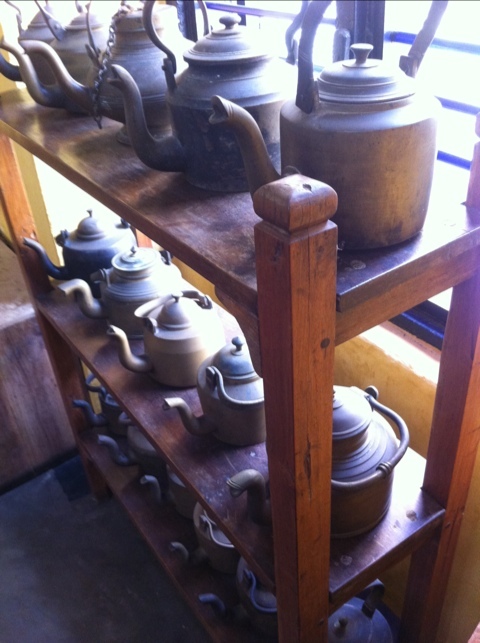 ), whilst parathas are normally served at breakfast with chai. I won’t say much about rice as it’s a grain I’m sure you’re all familiar with. However, I’ll introduce a small fact that surprised us: apparently a vegetable pilau should contain more veg than rice, whereas a vegetable biryani should contain more rice than veg (according to our teacher Sashi anyway). We both believed it to be the other way around! We’ve also discovered Kashmiri rice; rice cooked with various fruits and vegetables, usually including pineapple – a favourite of mine. It took us a while to ascertain the difference between these tasty little deep fried treats but I think we’ve finally cracked it. Pakoras are vegetables fried in a spicy chickpea (gram) flour batter, whereas koftas consist of vegetables that have been mashed together and moulded into a ball before frying, whilst cutlets are essentially flattened koftas. The nice thing about our experience with these finger foods is that they are much more flavoursome than their British counterparts. Sadly samosas were not covered in our cooking class but we discovered some of the best samosas I’ve ever eaten in a great little eatery in Jaipur named LMB. Samosas in India are much larger than those tiny little things we get in the UK, they’re also far more sumptuous. These fist-sized triangular parcels, packed full of vegetables and spices deliver a good kick with every bite. Our favourite samosa outlet serves them up with generous helpings of mango and coriander chutneys, the sweetness of which provide a good counterbalance to the spices inside. This is definitely a lunchtime favourite that will be sadly missed. Aside from their pairing with samosas, chutneys are something that we’ve found surprisingly elusive. They are however deceptively easy to make, mango chutney can be made by blending together fresh mangoes, sugar, salt, chilli powder and a little water. When mangoes are not in season fear not! Simply substitute the fresh mangoes with mango powder (a very intense and sour powder made from dried mangoes), add some extra sugar and water and simmer until reduced to the desired consistency. Coriander or mint chutneys are made by blending the fresh herb with garlic, chilli, salt, a little water and some lemon juice, simple and delicious (maybe omit the garlic if you’re like me). Dosas are a distinctly Southern speciality; crispy rice pancakes that resemble giant brandy snaps in appearance but taste more like cheese on toast. A masala dosa is curled around a generous dollop of spicy potato curry and served with sambar (a spicy lentil and vegetable curry soup) and a couple of other unidentified but flavoursome accompaniments that come with free refills. Very nice for breakfast, lunch or dinner – or all three! What to say? Curries come in an endless variety, so much so that I won’t even attempt to describe them. On most menus in India you’ll find a selection of veg and non-veg dishes. With a large portion of the population being vegetarian, vegetable curries are not just relegated to the lowly side dish as they are in the UK. We’ve had some very nice veg dishes including stuffed potatoes (a skinless baked or boiled potato stuffed with paneer and served in a creamy sauce), pumpkin curry, and okra cooked in dry spices (a favourite of Simon’s). 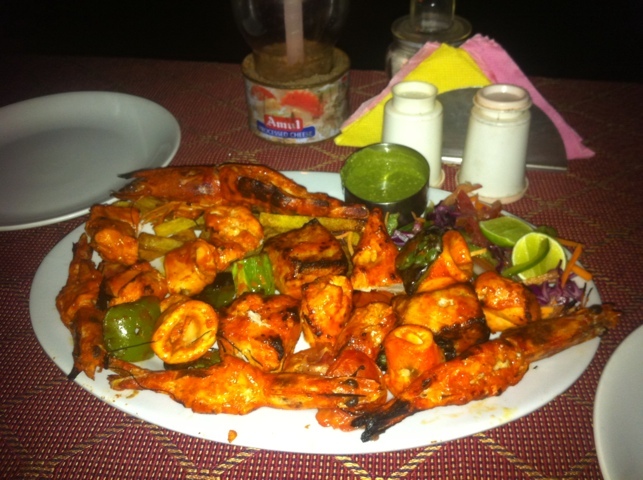 In the south we’ve had some delightful seafood dishes including prawn masala, meen papas (a creamy fish fillet curry) and grilled tiger prawns in a tongue tingling spicy sauce. 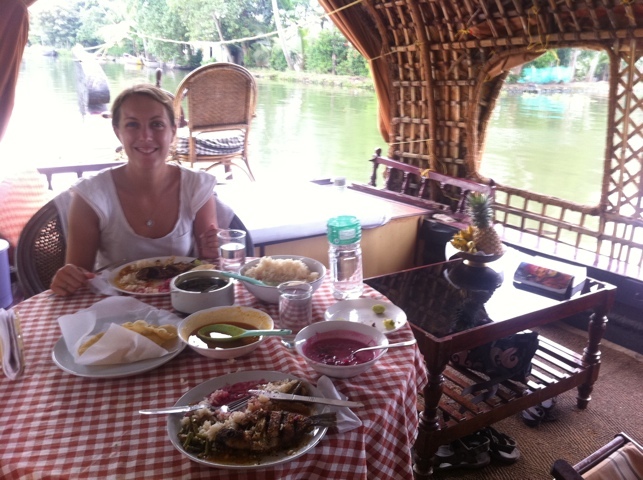 Curries in the south of India (or perhaps I should say Kerala since that is the only part of the south we’ve had time to explore) frequently have a coconut sauce giving them a flavour reminiscent of a Thai curry, although without the fish sauce. 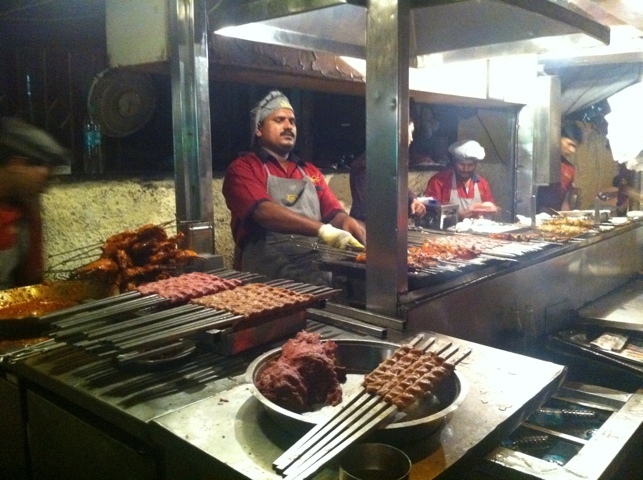 Meat can be a little hit and miss in India. For the most part beef is off the menu due to the Hindu sanctity of the cow. Pork is similarly omitted, presumably out of respect for the Muslim population, although this is just conjecture on my part. Mutton and chicken however can be found on most non-veg menus. Tandoori meats, either in the form of meat on the bone (e.g. Tandoori chicken), skewered boneless chunks (such as chicken tikka) or even minced and shaped into kebabs (common with mutton) are marinated in yoghurt and spices before cooking in the tandoor (clay oven) – delicious! When eating a meat curry in India you may prefer to choose a dish that is specified on the menu as boneless, otherwise you may spend your time picking what little meat there is off the bone. That said, most of meat curries we’ve had have been very tasty. 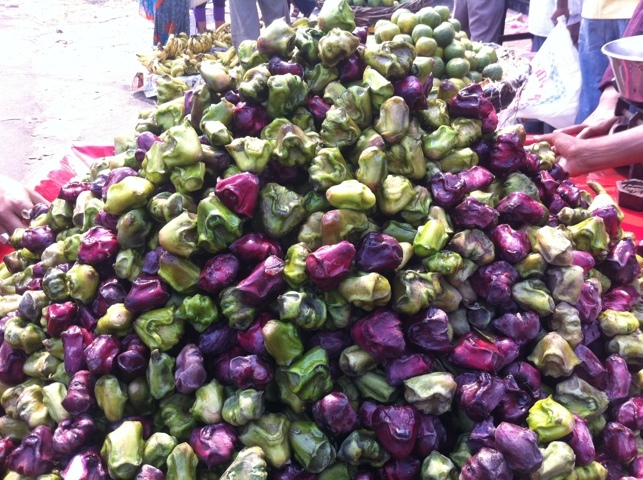 In the streets of almost every city we have come across vendors pushing carts stacked high with this miscellaneous green and purple vegetable that looks something like a cross between a mini bell pepper and a brussel sprout. What this vegetable is, or how it is supposed to be consumed we have no idea, the only thing of note is that the sellers periodically pour water over them. If anyone is able to identify this vegetable for us it would be most appreciated! Lassis are yoghurty drinks, which can be plain, sweet or salty, fruit flavoured, chocolate flavoured or in the case of the Rajasthani specialty ‘Makhani lassi’ saffron and sultana flavoured. Lassis (or at least the sweet type, I cannot account for the salty variety) are very refreshing, providing a cooling antidote to both the hot climate and spicy food. 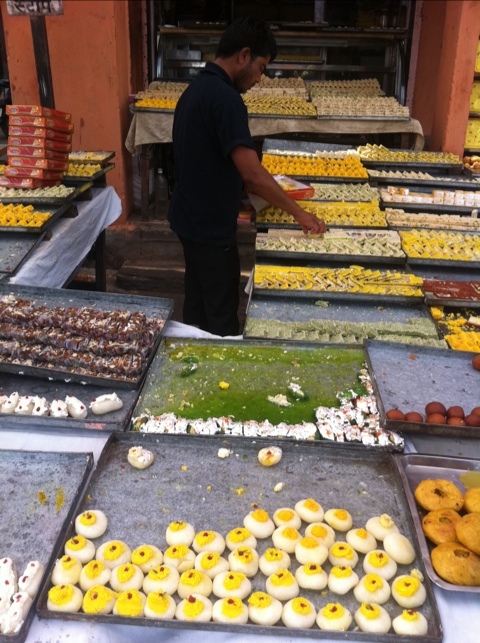 You’ll find Indian sweets glinting temptingly at you like little sugary gems behind many a glass counter. We saved this treat for Diwali when sweet shops suddenly pop up from nowhere, bursting at the seams and spilling out onto the pavements, selling large boxes of assorted delights to share with friends and family. We stood in front of a counter and tentatively picked out a small selection to fill our tiny box. Of the sweets we sampled (and you’ll have to forgive me, I don’t know their names) were a round white coconutty one (a bit like coconut ice), a thick treacly cube in a paper case (similar to the topping of a treacle tart), an almond diamond topped with shiny silver leaf (essentially pretty marzipan) and a number of fudge-like sweets (including one chocolatey affair). We enjoyed these little bursts of sugar amidst the Diwali fireworks from our rooftop, a spectacular way to sample India’s sweet offerings.